This view is from the other side of Minnehaha Creek, and shows the park building in the back. Directions: To get to the park from I35E, take the Randolph Avenue Exit (Exit 104A). Turn right on Randolph, and continue on Randolph for 1.1 miles to Snelling. Turn left on Snelling and go .6 miles to Ford Parkway. Stay on Ford Parkway for 2 miles (the name changes to Ford Bridge/Ford Parkway and then across the bridge to 46th Street/Ford Bridge). Within a block after the bridge, turn left on 46th Avenue for .1 mile, and then take a right at the stop sign onto Godfrey Parkway (There was no street sign to identify Godfrey, but it is the first stop sign on 46th Avenue). Follow Godfrey Parkway for .3 miles to a parking lot. The address for the park is 4801 Minnehaha Avenue South. 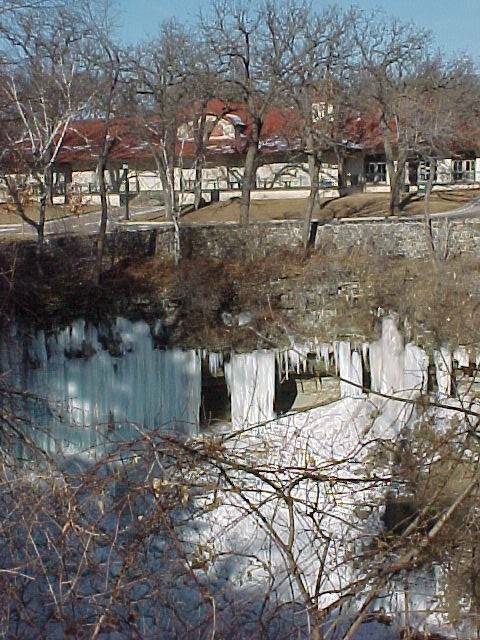 Notes: I visited Minnehaha Falls on January 18, 2003. From the parking lot, follow the sidewalks past the park building down the hill to the stone wall. The falls are just over the wall. There are steps and a bridge over the water to get to a view from the other side. Or downstream a little from the falls, there are steps down and a bridge over the water to get a view of the falls from below. 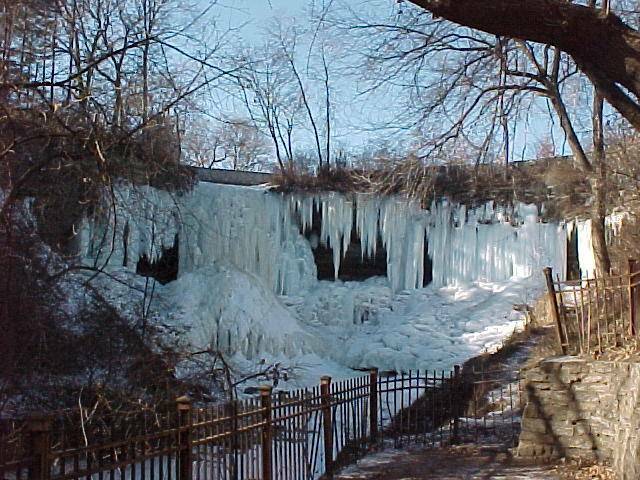 The park building was open when I was there in January (it was Saturday); the hot cholocate tasted good after the cold walk to the falls.They also sold postcards and such items as Minnehaha Falls sweatshirts (both plain and hooded) and Minnehaha knit hats and scarves. I didn't realize it at the time I was there, but you can follow Minnehaha Creek downstream until it reaches the Mississipipi River. Minnehaha Falls is the waterfall Henry Wadsworth Longfellow wrote about, from a photo of the falls, in his "Song of Hiawatha." 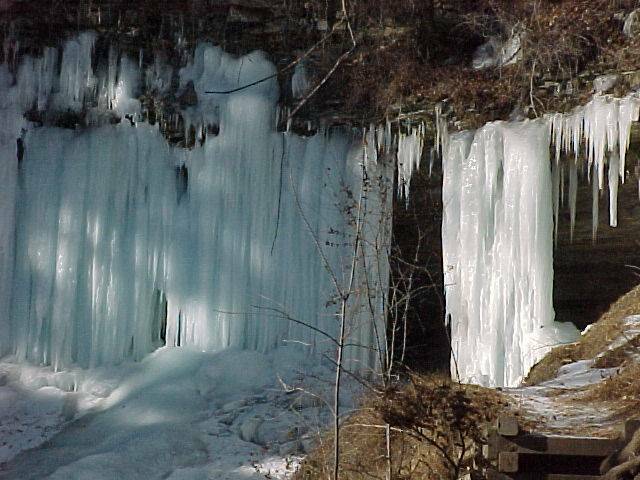 "The name Minnehaha, in the language of the Dakotans, can be broken into: mi-ni for water and ha-ha for waterfall. The beloved term, 'Laughing Waters,' was officially coined by Mary Eastman in her 1849 book 'Dahcotah.'" 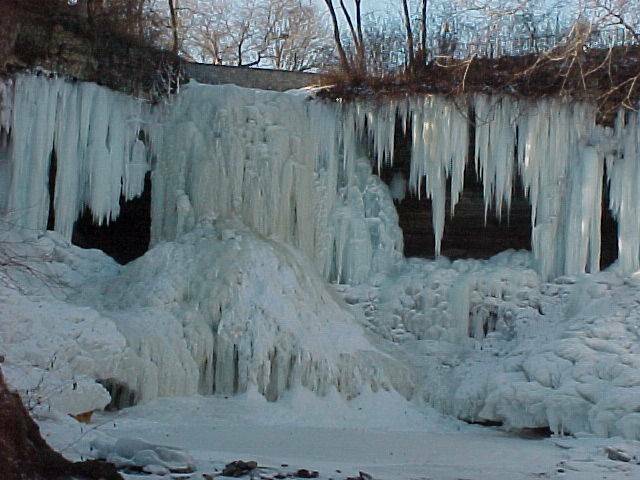 See Minnehaha Falls History. Page last updated 20 Jan 2003.